The forecast below was made on 27 August, 2013. It was wrong about who will be PM but psychologically was kinda correct. When Rudd accepted defeat he was surprisingly “happy” as the chart showed about his emotions on the night. Abbott may well have experienced a jolt when he recognised his win carried the weight of responsibility of Prime Ministership. Regardless, I was wrong in my prediction and I’ve learnt something. One of the things the exercise of drawing up the charts did was it gave me hope for a week. It was also a great mental/emotional exercise in that the process allowed an objectification of feelings and thoughts, so allowed me to be more detached. If the result is seen as a secondary consideration and the process, the means of arriving at the result, is primary then the exercise was a success. This is by no means a rationalisation of getting the wrong result. It is a statement of fact. As the saying goes, it is the journey not arriving at the destination that is the fun part. This is true of astrologising. Will I do it again? Yes, for all the reasons I stated above. It was an interesting exercise in ordering my feelings, intuitions and thoughts about the Australian Election, 2013. The chances of accurately predicting an election by pollsters and journalists are pretty dismal. If I toss a coin, there’s a 50:50 chance of being right. That’s not bad compared to some political commentators’ predictions. A few years ago I came across an interesting article that said nearly 80% of astrologers who attempted, accurately predicted the 2012 USA Election outcome at least 3 months and one 26 years before hand! In his 1976 book “The Astrological Chart of the United States, from 1776 to 2141” Gar Osten wrote that the year 2012 would see the “re-election of the incumbent president”. Intrigued I looked further into it because an 80% correct result is not bad considering most mainstream media had written Obama off before the election. A prediction 26 years beforehand is mind blowing. I looked into each of the astrologers’ forecasting methods and predictive techniques. I wanted to filter out all approaches that were foreign to my approach and/or would require a level of expertise I didn’t have. By the end of this looking I found one I could adapt to my approach. Now, I’m aware that most of you reading this have a critical and sceptical view on astrology. For this reason, I’ve wracked my brains over how to structure what I want to say about the coming election because I use astrology as a tool for understanding life. If I wasn’t using this tool to make sense of current political atmospherics and wrote an opinion piece instead, I’d have no worries. For some reason the mention of astrology gets peoples’ backs up and they immediately throw an Art that works with Time into the recycle bin. Most people are happy to read opinions and commentary based on other biased opinions and commentary churned out in mainstream media. An opinion based on astronomical data ie number, generated by an active imaginative interpretation of this is “superstitious”. However, an opinion based from within a Press Gallery Reality Bubble is not. Is the Press Gallery commentary scientific? No, just an opinion embalmed in a mainstream media consensus reality. The stars and planets I’m concerned with are archetypal forces, mytho-poetic currents within humanity. Astrology for me is a means of exploring the edges of rational thought as it touches the unknown. The horoscope is like a semi permeable membrane, it can suspend the ordinary associative processes of the mind and allow a different kind of attention to manifest. This attention, striking off from the symbolic elements of the horoscope gives a different kind of mind environment. Psychologists call it imagination. This way of looking at astrology is not accepted by most astrologers because it banishes star forces, energies, vibrations etc of the external planets and stars. This way of looking at astrology is troublesome for many because it says there is NO intrinsic meaning to the planets. It also points the way to divination. Divinatory astrology puts it on par with other mantic arts – like Tarot and the I Ching. To many astrologers this is anathema because they like to consider it as a “science”. Sometimes, in flickering moments, astrologising can be vision. A “vision – feeling” into another world that is holographic in structure, energetic and alive. In these rare glimpses, a human and the universe are seen as the same organism. As above so below, Hermes Trismegistus says. A different relationship exists between things – or at least that is what appears when astrological Sun glasses are worn. All this astrological stuff is just a pointing finger. This is not the place to argue the case for this ancient Art. If you are interested in how I perceive Astrology please click on these links on my blog. I recommend if you want to know more about astrological symbolism as used here visit Wikipedia’s Horoscope . At times I will link other keywords to brief you. Here goes – if my prediction is wrong, blame it on my reading, not the stars. Astrology has a method that forecasts “background” emotional weather of people for a certain time and place. By looking at the position of planets passing over the birth chart, astrology reveals the feelings engendered by the relationship between the planets and their position. The angles between them and their position in the chart speak. It is a language. It’s kind of geometrical / numerological in nature. Forget science, there’s no science to this – it is structured guessing using faint star signals from the symbols. It is always an approximation, a walk into the dark. There’s no question that becoming Prime Minister would make either Rudd or Abbott smile, if not dance. Losing would be devastating and a stiff upper lip not enough to hide it. How will Kevin Rudd and Tony Abbott “FEEL” at 6 PM September 7, 2013? I assume by then Australia would know who won the election, unless it’s a hung parliament. Who will be happy and focussed, looking forward to leading this country as PM? Kevin or Tony? Who will be shocked by losing and wondering what went wrong? Tony or Kevin? Who will be Prime Minister? The method I’m using shows what feelings / energies are present in the charts of the Prime Minister and the Leader of the Opposition at 6PM September 7, 2013. The chart with the best “feel good” vibe is the winner. The prize being government. The 1914 vote is the only September election to have seen an incumbent government defeated. There has not been a Scorpio Prime Minister elected in Australia since Federation. That last bit is important because Tony Abbott is a Scorpio. Kevin Rudd is a Virgo. Kevin Rudd will be PM with either a Labor majority or a hung parliament. How did I come to this conclusion? Please look at table below which shows what each sign/symbol represents so I don’t have to show each symbol every time I mention it. I am trying to interpret an astrological view point to those who are not literate in star language. 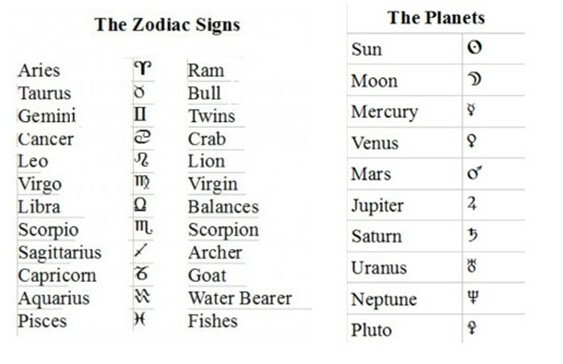 For the purposes of this post all you have to do, if you are not familiar with astrological symbolism, is look at the charts and refer to the tables below to know what symbol and position they represent. Rudd’s chart shows the transiting Sun in a section of the chart where mind expansion and open feelings predominate – philosophy, higher learning, travel are among the many meanings elicited by the Sun in that section – called the ninth House. (Houses in Astrology) Also here, there is a focus on communications – with people face to face and through media (transit Mercury over Sun). I would call the feelings shown as positive, happy, calm and confident. Notice the crescent shaped symbol of the Moon outside the circle is very close to the line separating the 9th and 10th House. Beneathe the Moon is Jupiter and both are near the line. This line is the Midheaven, one of the 4 most powerful positions – the Angles of a chart. It is at the top of the chart and is the most public point. It relates to social standing and reputation. It represents our public face and our overall sense of responsibility and standing in our society. It is in this context, the Prime Ministership of our country. The feelings shown with the various combinations of the Moon, Jupiter and the Mid Heaven line include strong rapport with people and a deep intuitive understanding between them and Rudd. I think it will have something to do with the cutbacks Abbott plans to make along with the inequitable PPL. The planetary combinations also show that Rudd will be able to feel out the mood of the people so that he appeals to their deepest emotional concerns. Having the Moon in the 10th House is also good for public relations. Along with the planets nearby, Jupiter has Uranus opposite it at the bottom of the chart. Uranus is the planet of freedom and release. This combination shows there is a deep transformation happening in Rudd’s subconscious. His whole experience of the world will be quite different after this transit. The chart shows that he will feel liberated and vindicated. He will be mentally sharp and alert because transit Mercury is conjunct Sun in the 9th House. He will be very conscious of his purpose in leading Labor, and it enables him to express that purpose clearly to others. His expression will be vigorous and impressive. Along with this he has tremendous intellectual and mental energy conferred by transit Mercury conjunct Mars. This means that Rudd will feel he is able to work with his mind much longer than usual and accomplish quite a bit. This will give him more confidence about leading Australia as PM. Kevin Rudd’s chart at the close of the election shows very positive feelings and thus has “feel good” vibes. This points to a win. 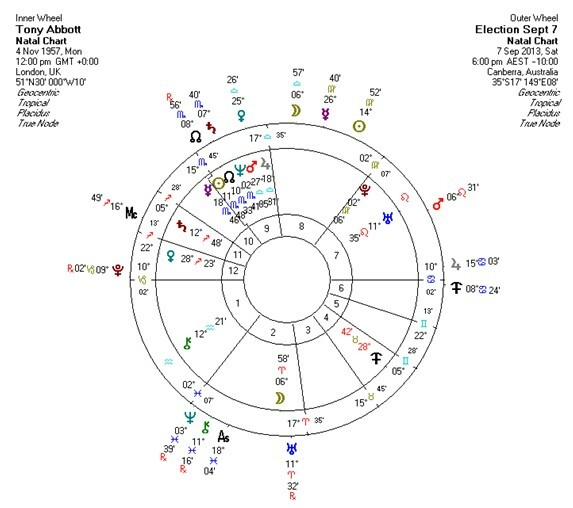 Abbott’s chart shows the Sun in the 8th House. When this transit happens (it lasts about a month every year) there is significant psychological adjustment and transformation. Traditionally this is the House of Death, meaning Endings of things. In this context it means a death of some aspect of himself. On a more material level there is great concern about resources and finances. I believe it shows the end of his aspiration to be Prime Minister. It is not a happy place to be so I would say this planetary combination has a “bad feel” vibe. It is not all bad because he has a good aspect /angle (sextile 60 deg) between the transit Sun and the Sun of his birth chart. This shows an integration of his energies and that he will be able to work effectively with others. Abbott also has a good angle (trine 120 deg) between transit Jupiter and the Sun which shows he will be calm and confident and feeling he can do anything. He will also be able to see events clearly and plan well. This is definitely a “good feel” vibe. Note that the angle between Jupiter and the Sun is not as strong as a conjuction where the planets are on top of each other. All the strong “good vibe” points in Rudd’s chart are conjunctions. Transit Moon directly opposite his birth chart Moon shows powerful emotions making it difficult for him to see any point of view other than his own. Strong potential for disagreement because he will feel his own interests and desires are opposed to others. This feeling may have something to do with losing election. This is a “bad feel” vibe. Transit Mars makes a conjunction with Uranus of Abbott’s birth chart. No other transit is more conducive than this one to sudden upsets, rash behaviour and surprising incidents. This will be the shock in finding he has lost the unloseable election. This is a very “bad feel” vibe. However, the transit of Saturn conjunct the Sun is what clinches my forecast that Abbott will lose the election. The energy of Saturn holds back the energy of the Sun. Saturn confines and restricts it so that he feels limited to do only certain things. Abbott will feel thwarted and his vision of becoming Prime Minister is now confined to the bin of history. This also is a very “bad feel” vibe. When you weigh both Astrological charts from the point of view of being “happy” it is obvious that Kevin Rudd has the Prime Ministership. I can only see two possibilities from the above – Kevin Rudd becomes Prime Minister with a Labor majority or in a hung parliament. Whichever – the next Prime Minister will be Kevin Rudd. Thank you for visiting Journeys and Star Gazing. Here there's stories of my various journeys, some inner but mostly outer; photos, song lyrics, poems, astrological readings and interpretations, I Ching speculations, quotes from people I admire and some cool graphics. There are reflections and archival material on various human rights campaigns I have been involved in over the years. With these, some have a "Star Gazing" interpretive filter. Posts include my interests in alchemy, magic, kabbalah, consciousness studies, the Fourth Way and anything else that may enter my sphere of living. I hope you enjoy your visit. I'd love to hear from you in the comments. Follow me on Twitter @dodona777 where I mostly comment on Australian politics and my blog interests. AusVotes 2019 Chart 18 May, 2019 8.00AM Canberra, Australia. 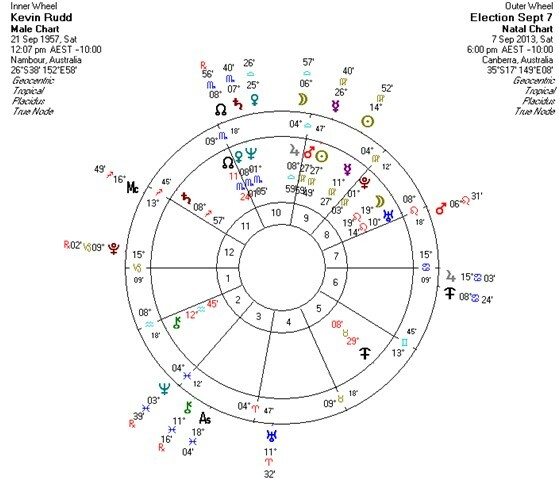 What does Australia’s Chart say about the Federal Election 2019?